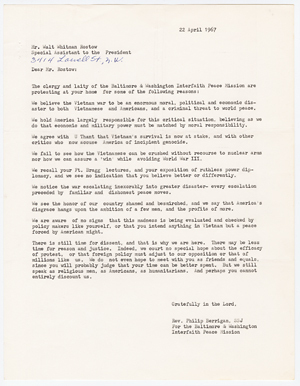 Letter from Philip Berrigan to Walt Whitman Rostow, April 22, 1967.
aster to both Vietnamese and Americans, and a criminal threat to world peace. do that economic and military power must be matched by moral responsibility. critics who now accuse America of incipient genocide. nor how we can assure a 'win' while avoiding World War III. lomacy, and we see no indication that you believe better or differently. preceded by familiar and dishonest peace moves. disgrace hangs upon the ambition of a few men, and the profits of more.